If you want an event to have multiple prices (e.g. 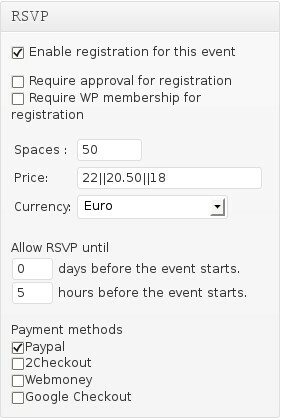 different prices for students, children, …), it’s as easy as entering a price in the “Add New Event” window in the EME admin pages.The value entered should just specify all prices, seperated by “||”. Now, as you specified 3 prices in the example above, people should be able to book for those 3 as well. For this you need to change the setting “Registration form format” for the event. One of two methods are available to deactivate all plugins. Use phpMyAdmin to deactivate all plugins.